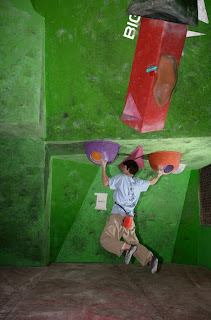 As you will have seen elsewhere on our website, its the time of year for our bouldering league down at the Works. For those of you who haven't tried these events before, or if you have but can't remember how the events work, here is all you need to know! The competitions take place on Friday nights, with one competition a month from November until February next year. Round one will be on the 14th November. Each round starts at 7pm in the evening and finishes at 10pm. The cost - well, you pay the normal rate to get into the Works, then buy a scorecard for the competition if you want to take part (for the grand sum of £2)! So, the competition....well, it's all about having fun (as all climbing should be! ), so its not super serious, and will have something for everybody. The problems start pretty easy (around Font 4+) and finish pretty brick hard (about 7c+). You just have to try and do as many as you can in the 3 hours. You can try each problem as many times as you like, and you score yourselves (the scoring system is simple, and explained on the scorecard). There will be 25 problems to try in the competition, and one extra 'special' problem! The special problem (normally dreamt up by me) is traditionally a real brute, and whilst you don't score any points for the competition by climbing it, the first person to make an ascent on the night will win £100 cash. Be careful though - we aren't in the habit of making winning cash prizes too easy!